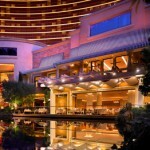 Wynn Las Vegas provides a unique fusion of nature and luxury in a resort fit for royalty. From the towering mountain at the front of the resort on the Las Vegas Strip to the Tom Fazio-designed 18-hole championship golf course at the back, natural beauty permeates Wynn Las Vegas. Lagoons, waterfalls, terraced landscapes, floor-to-ceiling windows, and skylights throughout the 217-acre resort create a tranquil and glorious environment. Fine dining, swank shops, a rejuvenating spa and thriving nightlife round out the resort experience. Flowers bloom throughout the Wynn property, both living and as part of the design. An indoor atrium near the lobby leads guests through a pathway of flowers and trees. Even the carpet in the casino portrays a colorful and thematic flower pattern. The Wynn also has some the top nightclubs in the world. XS nightclub is one of the most popular night clubs in the world. 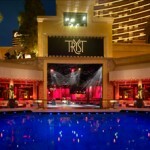 With some of the hottest Dj and with indoor and outdoor club seen XS is a must see if your in Las Vegas. XS, the luxury nightclub inside Steve Wynn’s Encore Hotel, has more elegance and sophistication than any other club on the Strip. The club is golden, literally—the chandeliers are gold plated, the crocodile VIP booths are gold-embossed, and the rest of the décor is filled with gold accents as well as beautiful ebonies and bronzes. At 40,000 square feet, XS is the largest single-room nightclub in Las Vegas, with 95 VIP tables indoors and 30 VIP cabanas poolside.